On the occasion of Republic day 2015 GOI issued an advertisement where the first/original preamble of constitution was mentioned. Original in the sense it was the one that was created when India became a republic. It does not contain the words “socialist” and “secular” as defining features of Indian republic, which were added in 1970’s. Opposition is up in its arms against this “omission” . BJP and some of the government representatives are indicating their willingness to debate and union minister Ravi Shankar Prasad expressed it. As can be expected, media tried churning a controversy out of it. It is called an omission, then a blunder, then a graciously granted benefit of doubt calling it a possible “oversight”. This is expected because it does not contain the current version which has the words “socialist” and “secular” that were introduced during the emergency-notorious Late PM Indira Gandhi’s tenure. The two words that are so dear to the liberals, leftists, secularists and proxy-colonial elite that they have used as scarecrows for decades to protect their fiefdoms, the two words that have been added under conspicuous circumstances with no democratic procedures followed, have been “let go” by the government run by a Hindu Nationalist. How can an omission of these two words be not mischievous and simply an error! But then, one must understand the secular predicament not just in the objection but also in not invoking any matter of intent and agenda. 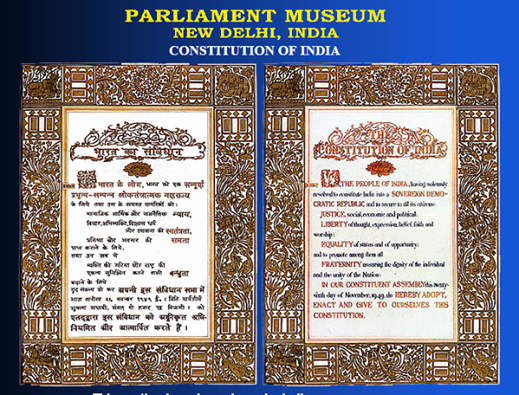 The original constitution’s preamble defines Indian union as a sovereign democratic republic. The 42nd amendment whose consequence is addition of these two additional words “secular” and “socialist” happened at the expense of democratic ideal. It is one of the most remembered amendments for the spirit in which it was done. When the Janata government formed later in 1977, the notion of basic structure was brought in so that such amendments do not occur in future. However, the Janata party and allies being socialist themselves, the government did not try enough to undo this modification of the preamble. So understandably, invoking this amendment reminds us that it goes against a more fundamental aspect of constitutional ideal (spirit of democracy) than those introduced with it (secularism and socialism). It not only shows those responsible for such amendment in bad light but also indirectly shows who respects the constitution more. Hence the predicament in limited protest, to only let the fact of omission but not of the merit of introduction in debate. However this event presents us with an occasion to not just see what transpired but evaluate the merit of the amendment itself. The fact that it was it was made without inviting a public debate and evaluation of the proposal does not fully explain lack of merit in the amendment – it only indicates an unjustified means, not unjustified ends. To examine the end achieved is also necessary, and in fact more important as it continues to impact policy in future. Obviously the words like secularism and socialism were not new in 1970’s, they were well known to the original authors of constitution in 1947-50 both as desirable and as prevalent ideals elsewhere in the world. If they did not form part of preamble of the first draft of constitution, it was not merely because some of the main aspects of rights were inspired by American constitution. It was also not because these two features were not sought to be present in Indian union’s policy. There are multiple reasons why these two words do not appear as the *defining features* of Indian union that appeared in the preamble, although they are in spirit not undesirable. One, they are not defining features of the nation and hence cannot and should not form the defining features of the state. Secularism originates from the need for church-state divide in Christian societies and simply does not arise as a requirement in a society like Bharata where statecraft always was inspired by a tradition-agnostic moral scheme and religious traditions prospered as power-agnostic knowledge institutions of society, through ethical epistemic argumentation. Similarly socialism does not become a requirement in a society which always prospered with a fine balance between trading and skill groups and has a large privatized social security system. In fact while the state calls itself socialist, the economic model followed by society is hardly socialist. So in both these aspects the nation by its very nature inherently lives by what these ideals try to achieve and are hence redundant. Not just that, the nation has a more refined system of achieving both these goals and demonstrated their successful implementation for several continuous centuries before these concepts were even conceived in the west. Two, secularism and socialism do not mean what they are made to mean in today’s Indian context. Neither is secularism about religious pluralism (or appeasement) nor is socialism about scuttling the nation’s productive potential to exploit a poverty vote bank. Three, while secularism is a non-starter for our society, socialism is not a permanent ideal and can easily degenerate into a temporarily acceptable or unacceptable economic policy which cannot hence be the defining feature of a nation or a union of states. Given the longevity and stability of Indian society, such temporal aspects can never be and should never be incorporated as defining features. Four, there is no moral locus standi for the demand that Bharata should be a secular state after the partition. Pakistan and Bangladesh are not carved for “communal” forces but for Muslims alone. Some elite try proudly claiming that Muslims got Pakistan whereas secularists got India, which is a polite way of representing a colossal fraud against the core identity of this nation, the Hindu culture and society. That hardly means the lack of willingness of Hindus to coexist: partition is entirely about the Muslims’ willingness to coexist. That means that this nation should be run according to the age old Hindu ideals of tolerance, pluralism, tradition-agnostic state, power-agnostic spiritual traditions, a nation and geo-culture duly recognized by the state and protected. That means this nation cannot be run with artificial ideals like “idea of India”, “secularism”, religious exclusivism and protection of intolerance as a right. Only then can it represent the true nature of this nation, its society and its greatness. The authors of constitution, unlike the uprooted and politically motivated leaders of the subsequent generations, had a much better understanding of what becomes a defining feature for the nation and hence Indian union and what does not, and how to frame the preamble accordingly. Hence they chose, with due diligence and in their wisdom, not to make these two words secular and socialist, the defining features of Indian republic. It is time there is a debate on the merit of the continuation of these in the preamble, the benefit accrued and loss incurred by the nation in these three decades since their introduction. It is time to evaluate whether there is any inherent contradiction between the secular-socialist policies and the universal worldview of Bharat, whether they go against the democratic nature of this nation, whether they created a problem or solved one. Whether making our state secular is inline with what constitution says elsewhere (such as taking control of Hindu religious institutions and giving complete freedom to minorities) needs debate. Whether undoing this inconsistent change is required to restore justice and fairness to constitution is required. It needs debate whether “secularism” made India’s religious conflict more acute, a case Prof Balagangadhara argues in this paper. The merit in advertising secularism as a solution to religious conflict when it is not by design about religious harmony but about state-religion divide should be debated. It is also required to be debated whether calling the state socialist helped making a policy that built or retarded our economic progress. It needs debate not just whether these two words should be removed but a policy of how and what the defining features of a state for Bharata should be. This entry was posted in History, Nation, Social Issues and tagged Indian Constitution, Preamble, Secular, Socialist on January 30, 2015 by skandaveera.